'Uslada' Услада (Mariya Kaulen, R. 2007) Seedling J06-1/3. JI (3 F.), 35" (90 cm), Early midseason bloom. 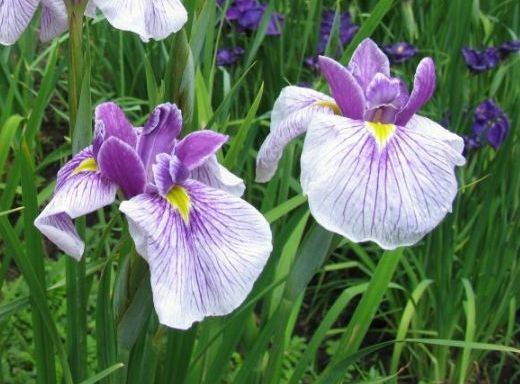 Standards and style arms wine-pansy-violet-rose; Falls white ground, slight wine pansy-violet veining becoming heavier toward center, disappearing at edges, yellow signal. J01–42, unknown, X J00–19, unknown. Kaulen 2007.